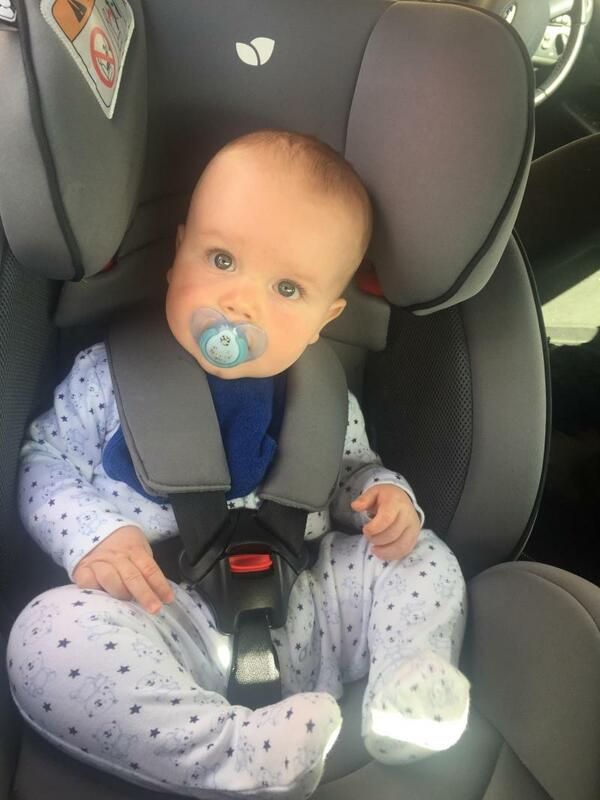 My little boy’s first car seat was a basic Mothercare one because I didn’t really know what I wanted, or my child needed until I started using one. After a while I knew I wanted to upgrade and this Joie model looked ideal. For one it should (fingers crossed) last my little boy until he’s 12 because of it’s, to me, ingenious ‘growing’ technology. The most important thing by far though was and is the ability to stay rear facing for much longer than most other car seats. My little boy has just turned two and is still very happily facing backwards. And given the safety benefits of doing so I won’t change anything until he hits four. The car seat is also extremely comfortable, he definitely falls asleep quicker in this one and always looks both comfortable and very supported. The covers are easily removed for washing which is handy and it’s fairly lightweight too. So they’re all the pros I can think off, now to the one massive con. The strap you have to pull to tighten the harness is a nightmare! It’s incredibly fiddly as you have to stick you’re fingers in a small slot to depress a button and pull at the same time. That would be annoying enough but the worst is that the strap itself seems to get stuck so you have to really pull hard, often feeling like you’re getting nowhere fast. Given that it’s vitial you get the straps tight enough for safety reasons this can be a real concern. And a royal pain when you’re little one is wriggling or complaining. All the pros I’ve listed have meant I’ve not sought to return the car seat but I’ve come close a few times. Such a shame as it’s such a well made and safe car seat otherwise. 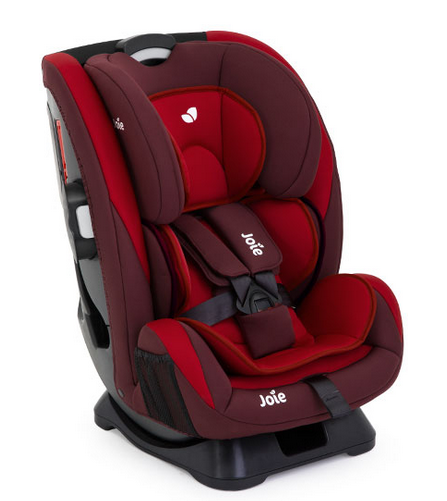 I absolutely love the Joie everystage car seat my little girl looks so comfortable in it and she is well protected and padded. The car seat has side impact protection and has really good safety reviews and I can see why, It is very sturdy. The newborn insert is easy to remove when baby is old enough and you are still left feeling they are well protected as they move up the stages. The harness is easy to adjust, there is 6 recline positions as well which i think is fantastic. Easy to fit into the car we use seat belt fitted and we have no issues at all. It is very heavy when putting into the car so we bought a second car seat so we didn't have to move it from one to the other. I think the price is great and i love the different designs you can get we chose the ladybird design and love it. Love the car seat wasn’t sure which 1 too but as so many but this 1 is great has 1 2 and 3 slide settings very comfy my boy does not complain. Grows with the child. Easy to fit and use. This product is easy to fit and use. My baby is so much more comfortable in this seat and I love the fact that it will grow with him. I love this car seat and would buy it again for my next baby. 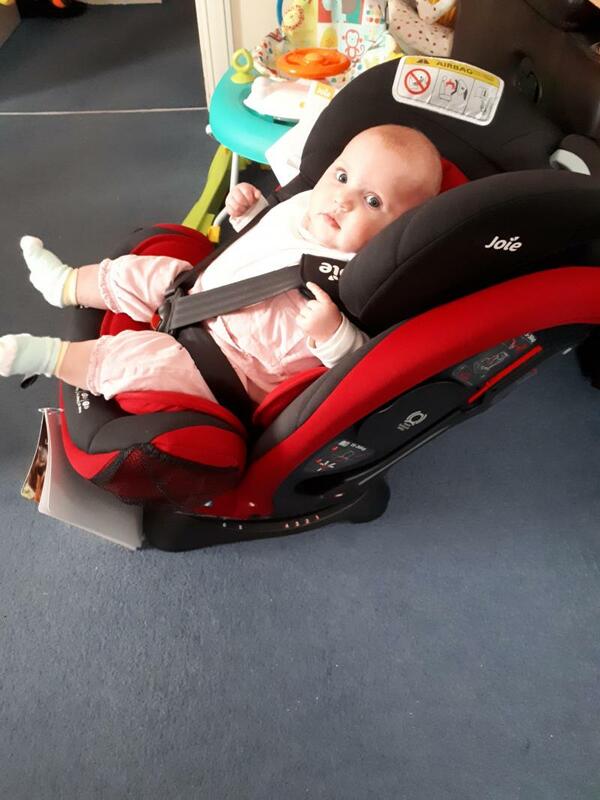 It is so much safer than car seats that come with travel systems etc and it was easy to install. My baby looks very supported and comfortable. Brought this car seat for my baby when she was 6 months old and she absolutely loves it she’s secure and comfy in this car seat and the price is very reasonable for the product. Very happy with this purchase. We brought this for my son when he was 3 months. As he was a big baby & to heavy to carry around in the car seat, we brought this one because it can go rear facing & forward facing, it reclines 3 times, & grows with your child so he’s still in it now at 4 1/2 years old, my sons favourite part of the car seat it the side pockets for his drink & toys to go in safe & so he can reach them himself. This is an amazing car seat. My little boy looks so comfy in the car seat and enjoys car journey’s. we had a small car crash and the car seat didn’t move and my little boy wasn’t harmed at all was still really safe. So we knew that we needed to get another when we replaced the old one. I brought this car seat when my daughter was first born, it was the best car seat I’ve use and I had 5 on my first born. I feel so happy and safe feeling putting my newborn in the car. She looks comfortable and joie make sure they do extra testing on their car seats which as a mother makes more happy. This car seat is a great buy if you want your child to be rear facing as long as possible. It allows you to have them rear facing up until they reach 18kg. The downside is you can only use the 5point harness up until 18kg with other car seats offering this up to 25kg. The car seat is also quite bulky so moving it from car to car isn't easy and trying to get in the back seat in between two is difficult. I also feel that it tells you that it can be used for every stage a but of false hope that you won't need to bye another car seat. Car seats expire usually in 6-8 years so I am unsure how it can state that it will last from birth up to 12. We have had not a problem with this car seat after having it for over a year and using with our 2 year old. Works well in rear facing, and child was happy. Worth the money, and will be purchasing another one when our baby moves onto the next stage. This seat is brilliant if you only want to worry about finding one car seat for all your child’s growth stages. Easy to install and change between stages. There are inserts to use with the seat if used for 0+ stage. 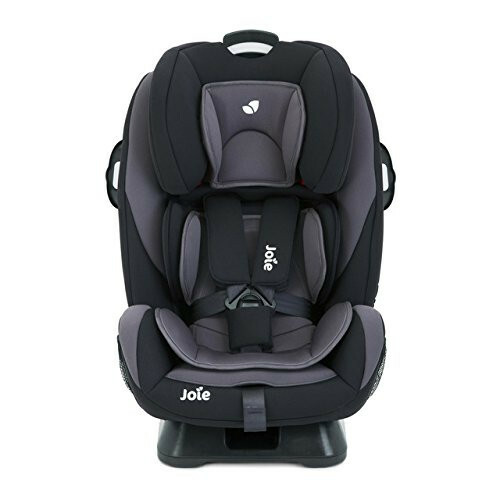 It is extended rear facing to 18 kg which means a child up to the age of 4 (on average) can sit rear facing, which is safer for them. The harness tucks away as the seat ‘grows’ but the only downside is that the 5 point harness is only used to 18kg, until stage 2 of the seat. A few people have stated in reviews that I read that the harness is hard to adjust and to clip together/release however I have not found this problem. We brought this to replace the one i had for the hosp when my son was born, its perfect i cant fault it at all, i love the fact that it can be rear facing for so long. my son falls asleep in this every time the pockets on the side are handy. it seems very well made. I bought this for my 3rd baby because it goes up to all stages till booster seat it. For my 1st 2 boys i had to buy seats all the time as they grew so quick . So when this came out it was a godsend. 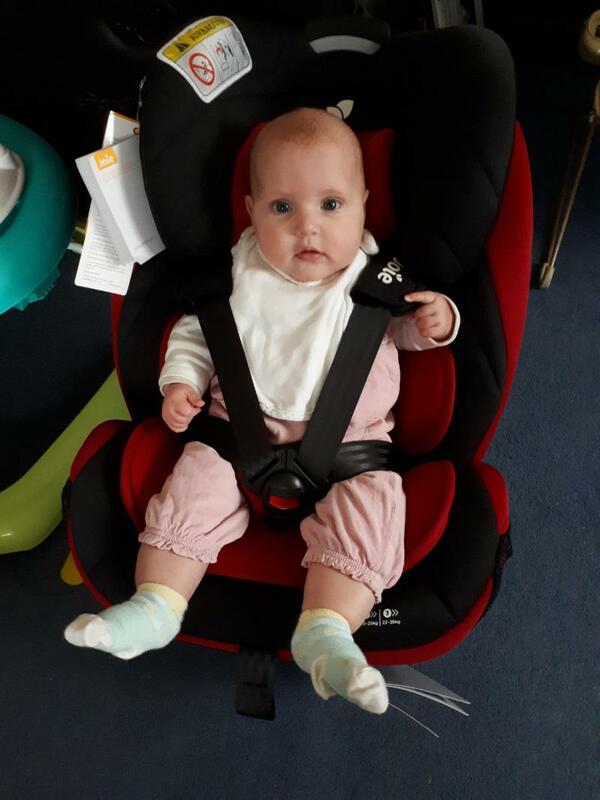 My son has been in this car seat from around 11 months old as he has always been a big baby, it is nicely padded so is very comfortable and the straps pull nice and tight so I know he is safe in it. 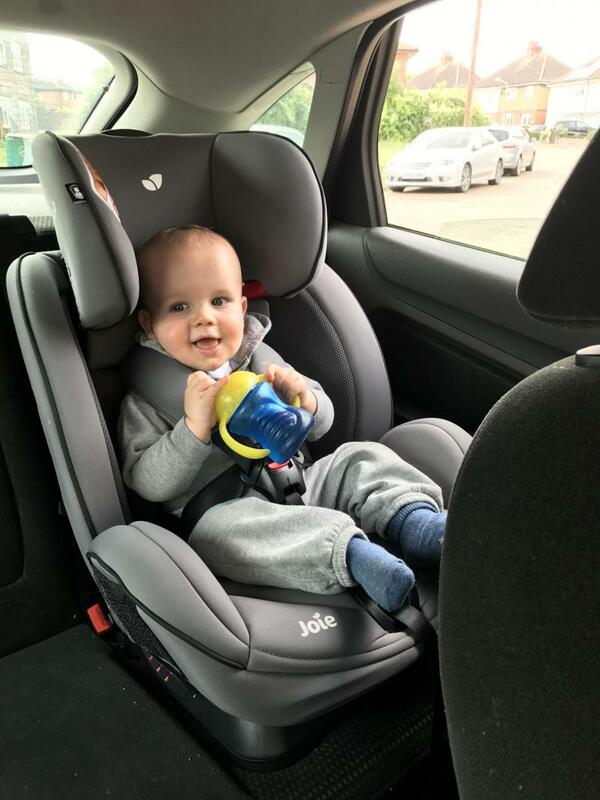 This car seat is very easy to adjust to the second stage which my son is now in, the instructions are really easy to follow and it is really simple to strap into the car. The only thing negative I can say about this is that the pads on straps don’t come off so I cannot wash them - which has left some unpleasant dribble stains. But I am so pleased that I bought this product and it was worth every penny. Suitable from birth up to 12 years. My only issue is the straps don't seem to stay up, forever having to put my daughter's arms back in which is difficult when driving. I have has this car seat since my lg was 6 months old she has always looked comfortable in at and always ends up falling asleep. With my lg been a bigger baby the high rear facing weight is great as she will last longer in the rear facing. I have got 2 think that seat is enough. Would like to see the front facing a bit more reclined. I drive a very old car where the seats are quite straight up. Means that my little one is also quite straight up even in position 3. Besiteds that love it. Would definitely recommend it. My daughter is in love with this chair, every time we go anywhere she falls asleep almost instantly and tells me it’s comfortable. I love this car seat. I use it for my nearly 3 year old. He is very comfortable it is easy to recline when he falls asleep to avoid him hurting his neck and has pockets on the sides for his drink and toys ECT. Easy to take in and out of the car within a few minutes. And lasts until a car seat is no longer needed couldn't ask for anything else. The product will last from birth right up until a car seat is no longer need. The car seat is great in terms of value, lasting from birth right up to when a car seat is no longer needed. Easy to install and use. Harness was a bit stiff to start with but loosens off with use. Very happy with the product. Bought this as felt the travel system seat we had wasn't as safe as id like. Purchased from local Halfords who installed it as well. Its very secure and baby seems happy in it. Was really good value for money as it will last up till age 12. Would highly recommend. Excellent seat, well worth the money when you think it's from birth to 12 years approx. We love that it rear faces for so long our 5 year old is still only 16kg so can continue to rear face for another 2kg. I also love how easy it is to change the settings so can easily adjust height and put the straps away if I'm picking up my older niece. Really easy to fit and we have had it in quite a few different cars. The extra inserts are great if you have smaller little ones like us. 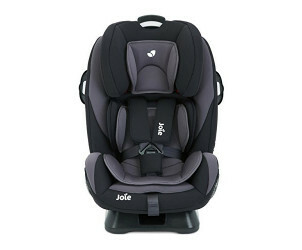 This is as great car seat and great value.for money as it lasts until 12 years old. This was the only seat we considered after friends recommended it. It keeps baby still in the seat with not much wiggle room which is what I would want if we were in a car accident. I like that you can remove the inserts to make baby more comfy. The only downside I have found is that it is hard to put baby in rear facing however my way around it is to take the diagonal belt from the back and turn the seat and then re tighten the seat belt which in a way is a blessing as every journey I am checking baby is secure.